Summer, summer, su-mmer ti-ime! Ok, so any Fresh Prince fans out there? Eh, maybe so, maybe not. If not, you should be. If you were, you would be able to get the beat of that song in your head right now and be vibing out to the good-nature of warm weather and youthful freedoms. If not, then just select your favorite summer song (of which there is no shortage), and go with that. As motorcyclists, summer is a mixed bag. While we enjoy the warm weather and relatively unobstructed roads, it also can get pretty warm on the bike in 90 degree heat. For such occasions, an open-face helmet and the highway breeze that it provides can seem like a good idea. 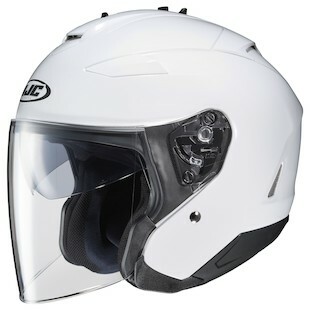 The HJC IS-33 II Helmet is a new offering from HJC that works as an open-face helmet while still providing a respectable level of protection against debris from the road. With a full coverage visor, and internal drop down sun-visor, you can get complete openness throughout your field of vision while also allowing for a good bit of air to swirl around your lower jaw. As this helmet is constructed of an advanced polycarb composite shell, it is relatively lightweight while still meeting DOT safety standards. CAD technology was used in its construction so that it remains comfortable throughout the day and aerodynamic throughout the ride, while an advanced channeling system flows air throughout the upper half of the helmet to work extra hard at the task of keeping you cool. The main thing here is to just get out and ride. Enjoy the weather. And if you are in the mood for a bit more airflow and a solid open face, shielded helmet, throw a gander to the IS-33 II from HJC.